How to paint landscape mountains river. How to paint landscape mountains river. 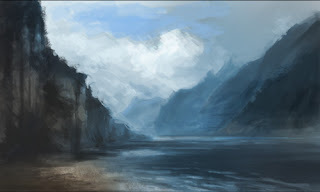 Environmental sketch concept digital painting video tutorial, Cliff Mountain Cloud Sky water landscape. Here is another environmental landscape sketch exercise I did. This one is pretty similar to the previous environmental sketch tutorial except I focus more on simplifying shapes and strokes. Details painting is good only when the moment comes, painting big scale stuff I believe I better off make it simple first and arrange the overall composition and values before going in and add unnecessary detail. It's easily said than done. But practice make us better artist. So...keep painting and drawing, also important to keep keen eyes for observing and study. Compare to the previous one ( Environment digital painting process ), I prefer this piece more because of its simplicity and implication with just big strokes rather than trying to go in and fill all the unnecessary information. The lighting, depth and color range are also a bit better in my opinion. Anyway there are more video tutorials on environmental concept sketch go to and pick on of the following: Draw and paint Environmental concept Sand Valley, Drawing and painting environmental concept Magma Fall, Draw and paint landscape mountain rock, and Environmental concept tutorial IceScape. Premium TUTORIALS: *Over 60 minutes to 2 hours of video. Good one brother. yeah friday night with some good environments, like it! Keep sharing the good vibe Xia!! Great work Xia, can't wait for more! I love your blog. Your works is really beautiful and this site is very useful and inspireing. I'm a hungarian blogger, who loves to draw and in Hungary there is an award (Creative Blogger), which I would like to hand on to you now. Thank you if you accept it. Please visit my blog on the below link to get it. hi there, guy! ive been looking at your blog for a long time now, but only when i can. and ive only started doing my own blog recently. Simple but beauthiful. Good work, Xia!! I love that use of an overlay layer and didn't know about it before. I find it's really useful for covering huge portions with local color, but do you stick to that layer for detail work? I find trying to bring out details on an overlay layer somewhat difficult. Derek> I usually merge them down and work on normal layer, until I really really need overlay then I will make another then merge after Im done with. I gave it a go but mine didn't turn out nearly as nice as yours. Got any tips? Or notice what I did wrong? I reaaaaally never draw or paint so I'm sure I made all kinds of mistakes. Did you notice I say BIG shapes to begin with? Practice, practice practice. Focus on values ranges, soft edges vs hard edges. Once you understand that, you are on your way. We all have a lot to learn. You're the bestest digital painter :) Your tutorials are simply and good.